I wanted a bit of a light hearted easy read after the rather heavy books I had read and this fitted the bill perfectly. She was a cat burglar and he was an English gentleman to his fingertips. A most unlikely romance ever but stranger things have happened. Both of them meet under the most unlikely circumstances - he is also a thief searching for some indiscreet letters written by a friend to a man who is now trying to blackmail her and she is looking for an antique dagger that would prove a point and indict a man for murder. Add to this an international arms dealer, a bit of drugs on the side, murder of an entire crew, stowaways, a family of burglars and and a family of English aristocrats and what more could one ask for. for today whilst I sat and waited between appointments! I need to try another Gerritsen book - the first one I read was pretty good. Thanks for your review! I've read a couple of this author's books and enjoyed them. i like the sound of this one. 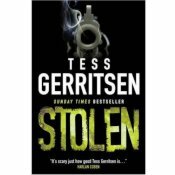 I have not read a book by Tess Gerritsen in a long while, this one is now on my wishing to read list so thanks for the heads up Mystica! Still Missing is on my wishlist. I want to see The Marble Faun made into a film. Come see why. Happy Blog Hop! Book Loot! Mailbox Monday days in advance!